A planning application for a scheme that will create temporary work space in 20 shipping containers in the heart of Frome town has been submitted to Mendip District Council. 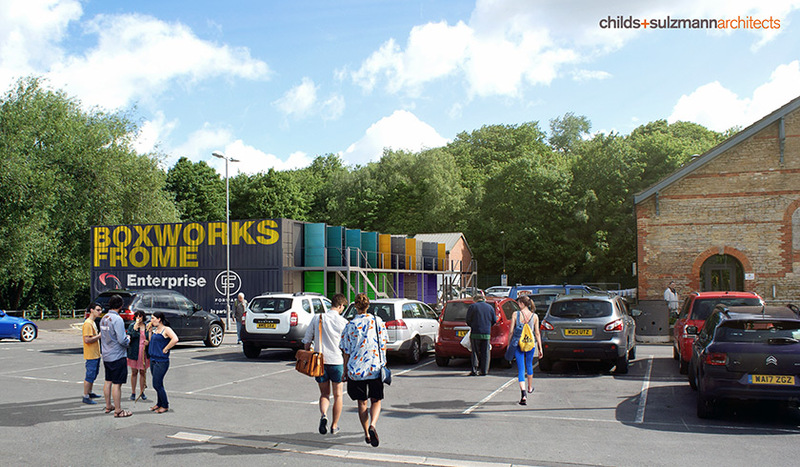 Childs+Sulzmann Architects, working with container conversion specialists, Forward Space, are providing architectural design and planning advice on the Frome Boxworks scheme for Enterprise Mendip. If granted planning permission, the 20 specially fitted out containers will provide quality, fully serviced flexible workspaces that can be rented to start ups, micro or SME tech, media and creative businesses with 6-8 people in each container. The concept creates a real sense of community for up to 160 workers with opportunities to share ideas and network in the centre of Frome. Each 40’ x 8’ container creates 300ft2 of useable office space, and the proposal is to group them in two levels of 10 containers. There is a proven lack of work space in the area and this development is seen as a fast-track remedy to a key issue in the district. “We have worked on a number of these container developments now and their huge success, such as the Boxworks at Engine Shed in Bristol, demonstrates the appetite and the potential for this 'meanwhile use'.” Mike Cox, Director, Childs+Sulzmann.